UPDATE - In a significant step forward, the US Senate has adopted a crucial "motion to proceed," triggering a formal floor debate over the GOP tax reform bill. It was a strict party line affair: All 52 upper chamber Republicans voted in the affirmative, whereas every single Democrat -- including "moderates" like Joe Manchin, Claire McCaskill, Joe Donnelly, Jon Tester, Bill Nelson and Heidi Heitkamp -- dutifully saluted Chuck Schumer and voted to block even debating middle class tax cuts and simplification. The Democrats failed, and the bill is now on the floor. This is an important procedural win for the GOP, but final passage will be a bigger test. "More bad news from the Congressional Budget Office showing that by 2021, people making less than $30,000 a year are going to pay between $5,000 and $9,000 more in taxes. By 2027, those folks could see an increase of up to $16,000 in their taxes," [he says]. The chart is not, as Velshi claims, a hard dollar estimate of the increase or decrease in an individual's tax payment. Rather, the chart displays estimates of the cumulative revenue the federal government will reap (in millions of dollars) from all individuals in the highlighted income brackets compared to current rates. For instance, in the 2021 column, the chart lists the number 9,000. 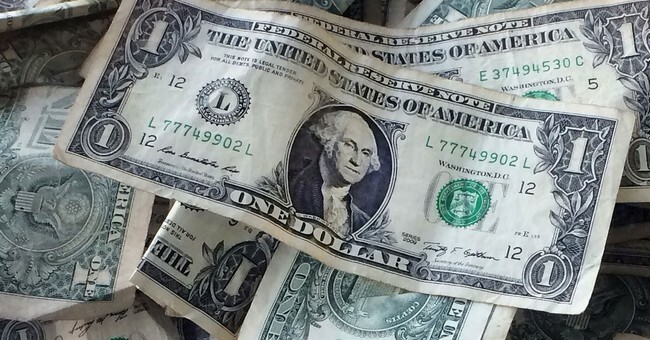 The number 9,000 is not $9,000; it represents $9,000,000,000. The chart's title clearly states the numbers in the columns are representations of millions of dollars, not single dollars. 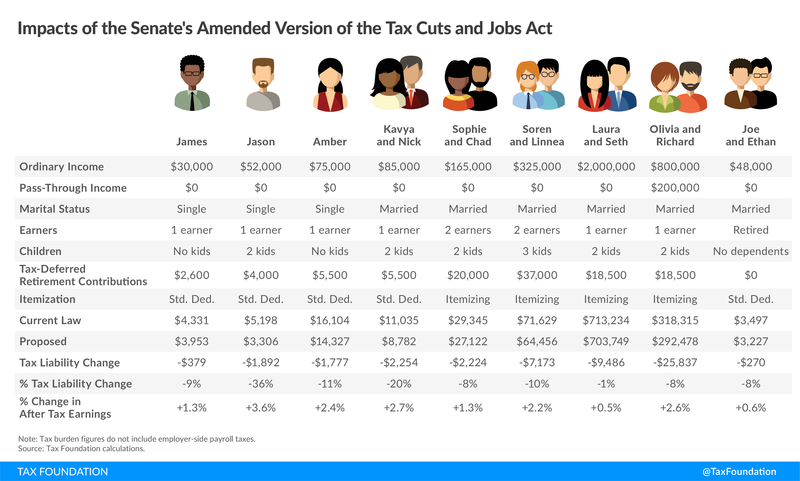 The accurate interpretation of the chart would be that, in 2021, the federal government will receive a collective increase in revenue of $9 billion from individuals in the $20,000 to $30,000 income bracket. Velshi's claim that "by 2021, people making less than $30,000 a year are going to pay between $5,000 and $9,000 more in taxes," is false. For political reasons Obamacare called its subsidies "tax credits" and runs them through the IRS, even though it's really spending. If people CHOOSE not to buy, CBO pretends the foregone subsidies are a tax hike. For more than a week now, some media outlets have been running wild with “distributional tables” from the Joint Committee on Taxation and the Congressional Budget Office claiming that — as a CNN headline last night put it, though the story itself was much better — “Poor Americans would lose billions under Senate GOP tax bill.” This is entirely an artifact of how the agencies approach the individual mandate, which the bill repeals. They think a lot of lower-income Americans won’t buy health insurance absent a requirement that they do so, and that as a result these individuals will get less in government subsidies. As Nicole Kaeding of the Tax Foundation put it, “Less of an advanceable refund from the Treasury results in the appearance of a tax increase.” She pointed out that the JCT itself had released a separate table that excluded the effects of repealing the mandate and showed, unsurprisingly, that all income groups got a tax cut. 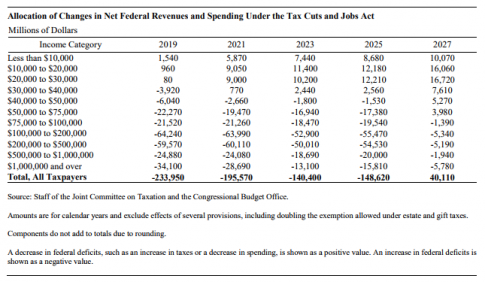 We now have such a table from the CBO as well. Through 2025, after which point the individual tax cuts expire (though they’ll likely be renewed by a future Congress), all income groups see a tax cut. Quote: "Our results indicate a reduction in tax liability for every scenario we modeled, with some of the largest cuts accruing to moderate-income families with children." The majority are automatic winners, as they're among the vast majority of all filers who take the (roughly doubled) standard deduction. Every household profiled in the analysis gets a tax cut and an increase in after-tax earnings. The smallest percentage cut and income boost goes to the richest couple. Another busted narrative. Parting thought: Many lefties are dismissing the Tax Foundation analysis, complaining that the group is "nonpartisan in name only." By that standard, the same could be said of the left-leaning Tax Policy Center, which...also found that Americans across all income groups, on average, would get a tax cut under the House-passed Republican bill.